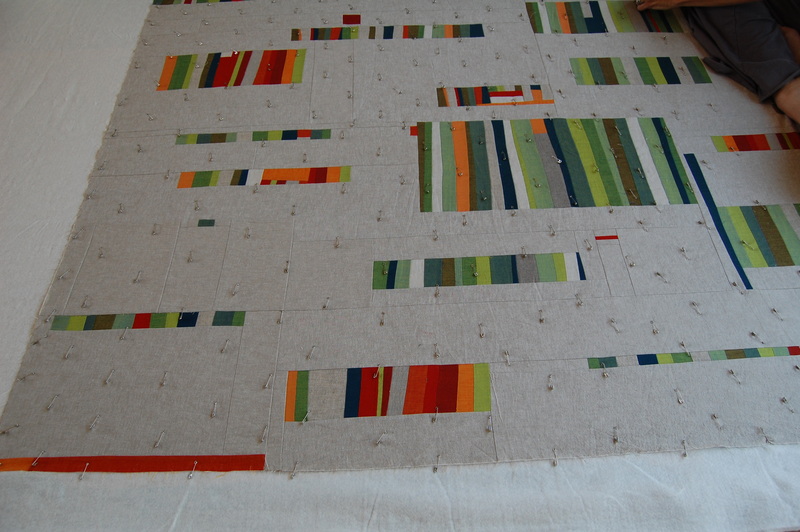 A Quilty Kind of Weekend…..
One of these days I’ll go and splurge for some more basting pins! I was all set to baste my Oakshott Untitled Quilt on Friday so I could spend some time quilting it this weekend, when I remembered that all my pins were still in Miss A’s Scrappy Strings Quilt! Soooo, best laid plans….. needed to be changed! I spent most of Saturday and Sunday morning, finishing (I think) the quilting on this quilt. 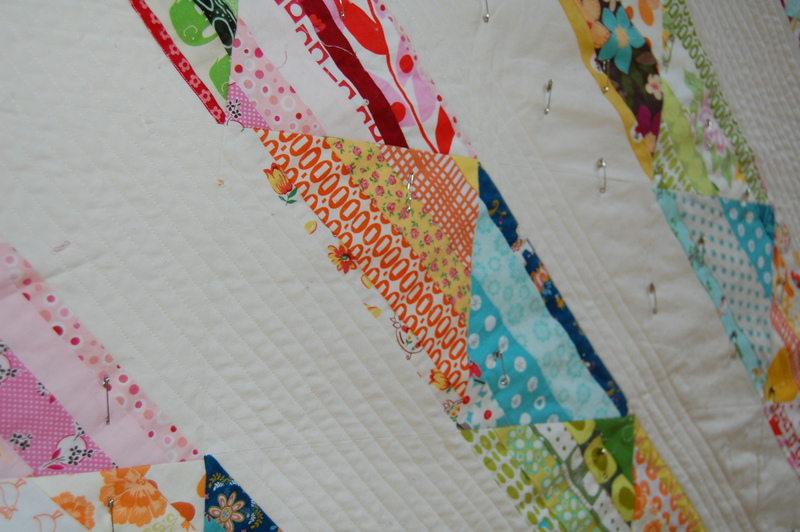 I can’t make up my mind about weather or not to add the hand quilting, or any quilting in the scrappy pieced rows. I’m so used to creating very dense, what I consider “modern” quilting lines, that the unquilted sections of the quilt are hard for me to leave alone. 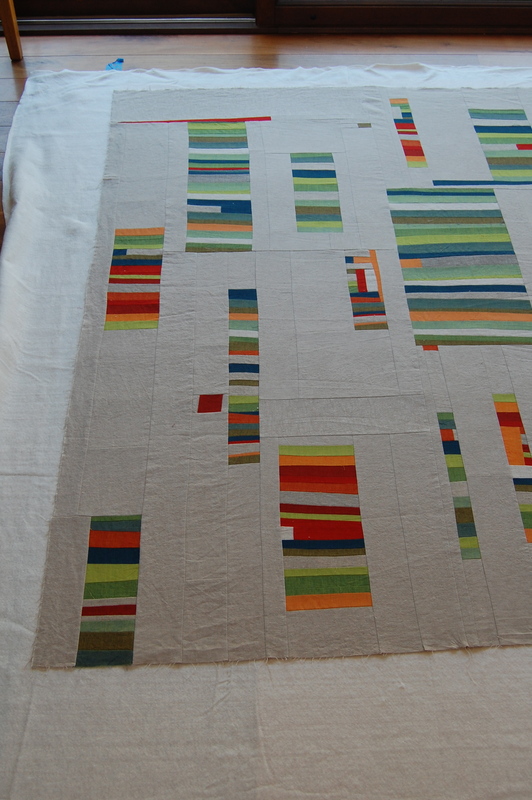 But I really want this quilt to have a modern, yet charming appeal to it. 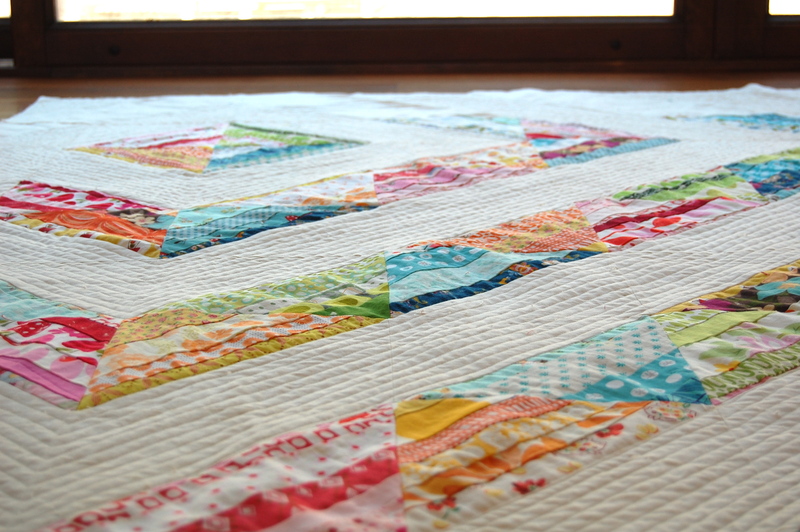 I feel like leaving alone or sparsely hand quilting those colored rows, will give that look and feel. Since I have yet to do any serious hand quilting (pulled out the little bit I did on this one), can anyone tell me if it would work to bind the quilt and then finish the hand quilting? I’d love to give this to Miss A for her upcoming birthday, but I’m sure I can’t finish it in time if I plan to hand quilt! I think I’ll need to rent episodes of some good shows to watch while I settle in to quilt this baby, if anyone has suggestions on some good shows to watch, please send them my way!! 🙂 Downton Abby is first on my list! Thanks! This Oakshott Untitled, as it’s titled for now, has been so much fun to work on and might be one of my favorites I’ve made so far. I began basting this afternoon and was finished in a couple of hours. That may be due to, or is perhaps in spite of, my lovely little basting helpers. Indeed, my girls have been very good at occupying themselves as I have been very creatively focused lately. We’ve had nice spring like weather for them to enjoy being outside, and Dad is great about running them around and making lunches, but after a while, all they want is mama! Anyway, during this basting process, I’m usually able to contemplate what type of quilting lines I think best suite the quilt…… or listen to Miss N tell me the names of all her doggie stuffy friends (notice bottom right corner). For this quilt, the inspiration is just not coming to me!! I’m thinking circles, but realize I need to sleep on it. I’ll hope for fresh energy and inspiration tomorrow. **Yawn** I’m kind of all quilted out after this weekend! I often bind a quilt and then do more hand quilting afterwards, mainly because I can’t stop tinkering! 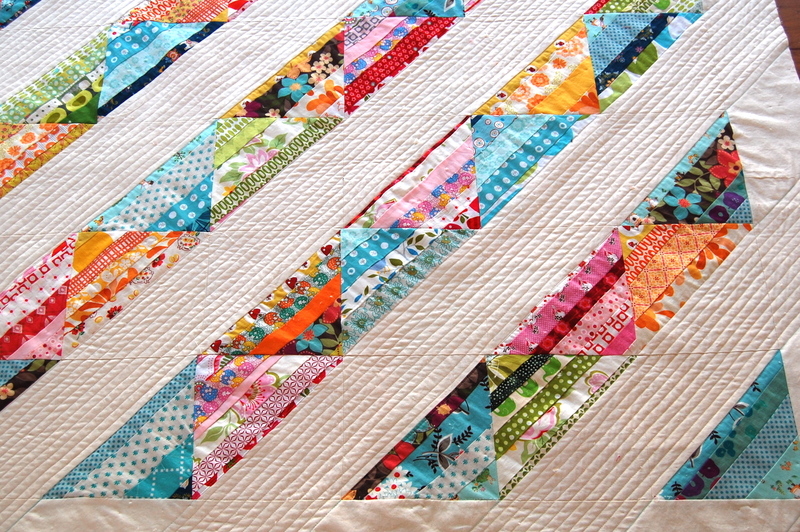 If you aren’t a hand quilter it might be difficult with all those seams in the triangles. Maybe you could just machine quilt in the ditch at the edges of the triangles and reverse the lines at the end of the triangles in the borders. It’s a great quilt. Thanks Lois! I had wondered if maybe quilting in the ditch along the triangle seam lines would be a nice look. I like that it would create a nice pattern on the back and it would still leave some “puffiness”. I may just do that! This quilt is a favorite, just behind the star. Thanks so much Cathe! I think I better get down to Roxanne’s for some #8, good to have on hand in case I decide to go that way. Decisions!!! both of these quilts are so stunning! 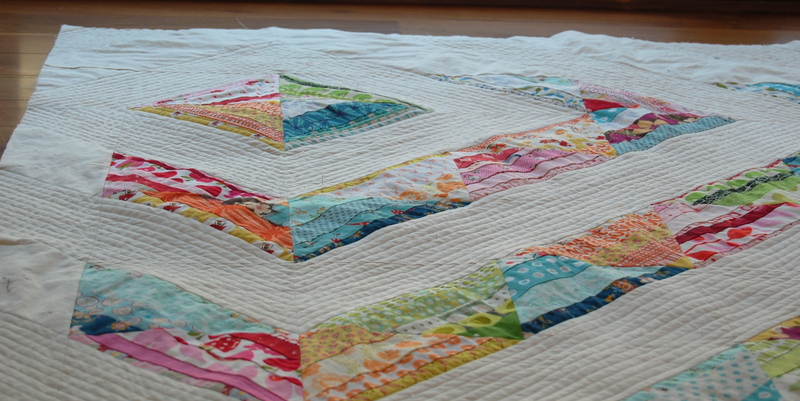 Love the dense quilting you did on your daughter’s one. I often finish the binding on my quilts and then add hand quilting later. You and your daughters are gorgeous!! 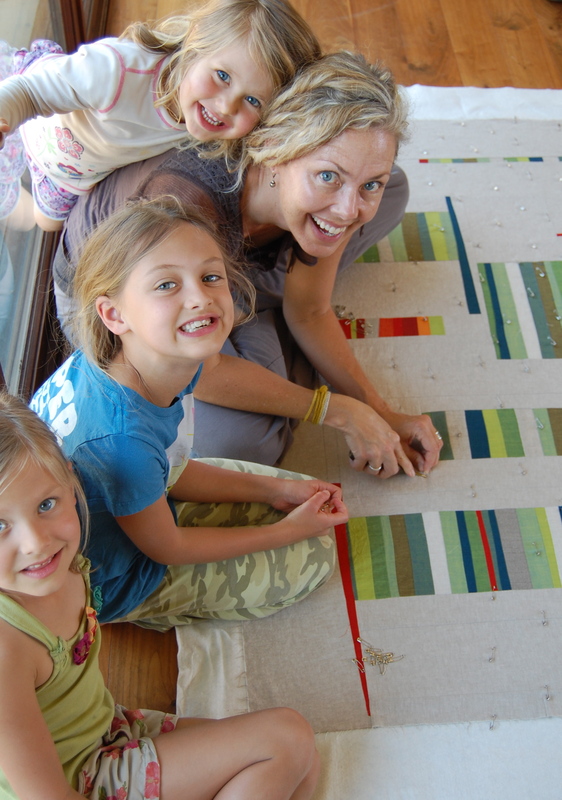 It’s so sweet to see your girls huddled around your work of art – which is just stunning. I just watched 5 seasons of Friday Night Lights and I loved every minute. Such great drama. Definitely guilty pleasure tv watching at its best. I just love this quilt! 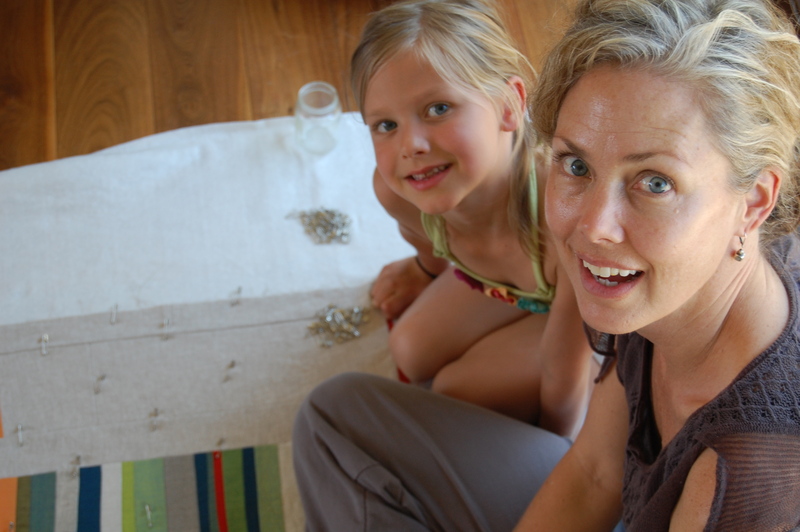 The photos of you and your daughters, and the one with the little feet in the corner, are my favorites–great photos! 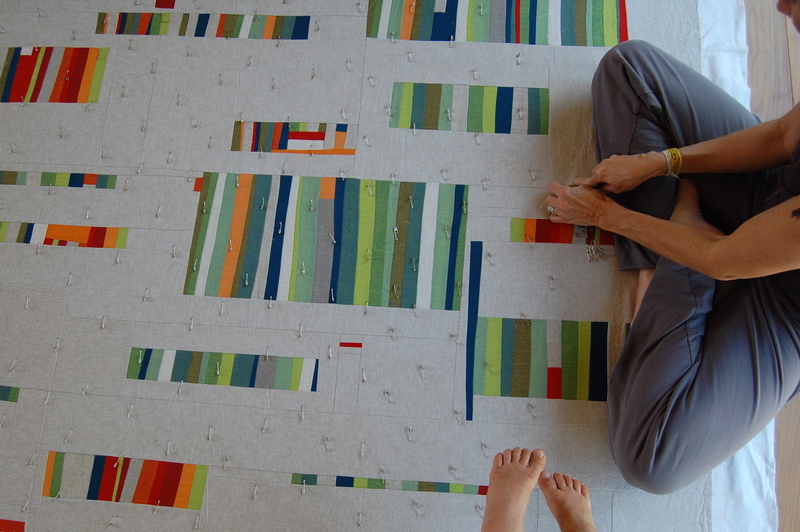 Did you figure out how you want to quilt it? I have two basted quilts waiting for inspiration, but am completely stuck! I would add some quilting in pieced triangles. I think the earlier suggestion of ‘in the ditch’ would be perfect. Hi, I just found you through Pinterest! Wow, Love the quilts. You have inspired me. I love the tight quilting lines and then not quilting the triangles. So cool. Glad I found you!